Minterne is a 1,300 acre estate in Dorset that has been the home of the Digby family for 350 years. Its large Elizabethan-style manor house is not usually open to the public. However, it is open to organized groups such as shore excursion groups from the nearby cruise port at Portland. Even if you have never been to Dorset, you may well have seen Minterne. It was used as a location in the popular movie “Tom Jones” (Susanah York, Albert Finney) and in the movie adaptation of Thomas Hardy's “Far From the Madding Crowd” (Julie Christie, Alan Bates) as well as in several television shows. 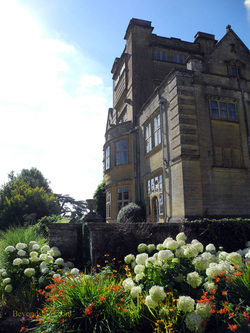 Minterne is perhaps best known for its gardens, which are open to the public on a regular basis. The gardens are laid out in the style of the great 18th century landscape architect Capability Brown. Rather than plant beds of flowers in a geometric design as in the French style, Brown and his followers sought to create an idealized natural landscape. They would move great quantities of earth to create hills, dam streams to create lakes and plant trees at strategic points to act as focal points. At Minterne, the grounds have been transformed into such an eye-pleasing natural scene with rolling hills, water features and stands of trees surrounding the grassy meadows. In addition, ornamental plants such as Himalayan rhododendrons, azaleas and Japanese cherry trees have been planted to enhance the overall scene. The house sits on the high ground with the gardens surrounding it in a horseshoe shape. It is a large house built in 1905. However, it looks older as the architect Leonard Stokes designed it in the Elizabethan style. This is not the first large building occupy this site. Originally, it was the Abbey of Cerne but when King Henry VIII broke with the Pope and dissolved the monasteries, the property was given to Winchester College. The college subsequently rented it to John Churchill and it spent the next two generations in the Churchill family. After General John Churchill, brother of the 1st Duke of Marlbourgh, died without legitimate children, the property, including the contents of the house, was sold to Admiral Robert Digby. Several of the Churchills' possessions, including the Churchill Tapestries, are still at Minterne. After the American War of Independence, many of the sailors who had served with Admiral Digby were unemployed. The Admiral gave them work landscaping the grounds surrounding Minterne House. Robert Digby was followed by another naval officer, Admiral Henry Digby, who earned a fortune capturing prizes during the Napoleonic Wars. He also commanded a ship of the line at the decisive Battle of Trafalgar, where the British defeated the combined fleets of France and Spain. Henry's daughter, Jane Digby, was raised at Minterne. Her life was scandalous by Victorian standards and included four marriages and numerous lovers including two kings. She lived for a time in caves in Greece as the “queen” of a rebel guerrilla army. Moving further afield, she married an Arab sheik who was 20 years her junior and lived happily in Syria until she died. Also raised at Minterne was Pamela Digby, sister of the present Lord Digby. A popular socialite in the years between the World Wars, she married the son of Winston Churchill. The marriage did not last, however, and following several affairs and marriages she married the American millionaire and diplomat W Averrell Harriman. She then became involved in Democratic Party politics and was eventually appointed United States Ambassador to France by President Bill Clinton. We met Lord Digby outside of the house, where he chatted with members of the group. A Knight Commander of the Victorian Order and a retired officer in the British Army's legendary Coldstream Guards, Lord Digby spoke charmingly and soon had the group captivated. He then invited us into the house for tea and a biscuit (i.e. cookie). Once served, we assembled in a large double-height room with arched ceilings. Here, Lord Digby told us the story of the house and of the Digby family. Following the talk, we were given some free time to explore the lower level of the house. It is not a huge house but has several large rooms done in the conservative style often associated with British country homes. Among the notable contents are the aforementioned Churchill Tapestries and several paintings including a copy of Van Dyck's portrait of Lady Venetia Digby. Visiting a stately home that is still occupied by the family is a more rewarding experience than visiting one that is being preserved. One is a living home full of people's possessions while the other is a museum with exhibits. The experience at Minterne was further enhanced by the opportunity to speak with Lord Digby and his son Henry, who were happy to answer the visitors questions and share insights. Minterne is located in the village of Minterne Magna on the A352 road.